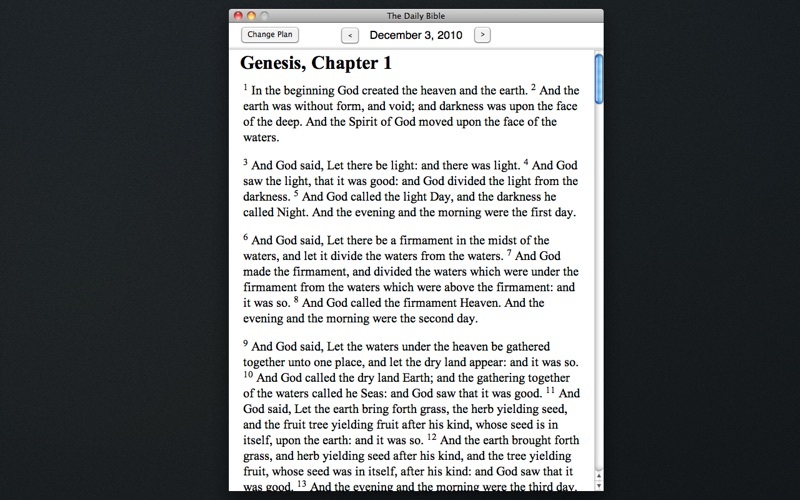 *FREE for New Years Day* Read through the Bible using one of 3 great daily plans. If your New Year's resolution is to finally get through the whole Bible in a year, this app is for you! The app provides you with your passages appointed for each day. Plus, you can easily jump back a few days to catch up if you missed a few. 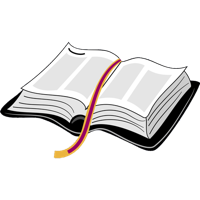 The app uses the Authorized King James Version (KJV) of the Bible, perhaps the most trusted and widely respected versions in the English language. Includes three great reading plans: - Straight Through. (Genesis to Revelation) - Straight Through, New Testament First. (Matthew - Revelation, Genesis - Malachi) - M'Cheyne Plan Based on the beloved family reading plan created by the 19th century Scottish pastor, Robert Murray M'Cheyne. This is a good app. I'm on the read the bible in a year setup, and im in 1 thesalonians and the problem is that there is more than on chapter to this book. Where are the other chapters? It only shows chapter one. It does this for several other book of the new testament. Please fix it. I read the bible every day, but sometimes I run out of time. I like that I can bring up a different reading every day, and I can start with the old or new testament. I agree with others who have commented that I wish there were other versions like NRV. I have several bibles and I like comparing the different translations. It is easier to read the newer translations than King James, but sometimes I like the wording of the King James. Also I like the ability to highlight certain paragraphs as I go it makes it easier to read. There is no Second Corinthians, and i wish you could go to a specific place. Other than that is great. There are days that i forget to read my bible, or i will just not know what to read. this is really helpfull, thanks!!! It works for what it is. Just a Bible Application. Would give it another star IF it let me search for a passage or had more features to get to a certain passage. Its a great Bible app and the reading plan is an awesome idea. I just wish I could increase the font size and change fonts. Also a popup reminder for the daily reading, like on the mobile app, would be nice. This app has a very clean simple interface. I downloaded it more for superstitious reasons, just feeling the need to have a bible on my mac as I have already read it 4 times in the last quarter century. This bible doesn't claim to be a reference bible, but I found I can use it as such by holding the curser over the advance buttton and clicking away. It takes 1-2 minutes to get from beginning to end that way and thats what I'll have to do until I can find a good reference bible. Macsword was sporadically problematic and the kindle offerings are limited (no RSV), and flaky judging by the commentary. Why this is so is kind of a mystery. Perhaps high tech cultural relativism and absolute truth assertions don't mix too well. I highy recommend reading the entire bible to anyone for at least a philosophical reference point. I would also recommend preparing yourself by reading some older english like Chaucer (hilarious) and/or Shakespeare (if you can stomach it) so that the KJV language won't be a distraction. It is humbling to find that there is basically nothing new in current human experience - with truths useful now and key to your eternal future, truths that might be missing in this app. I realized while reading James that it did not have the rest of the book, only the first chapter. It brings me to wonder if any other chapters are missing. This application doesn't allow me to search for books of the Bible to look up? Are you serious? I'm currently reading in the book of Luke so this is where I would like to start. Also, sometimes I like to compare verses in the book I'm reading to other verses in the Bible... This is very easy to do on my iphone but ridiculous on my macbook. This app deserves 1 star because it needs to be updated big time!!! The app is good for daily readings, but refering to a specific verse/passage requires unknown amounts of flipping pages. There should be a menu to go to a specific passage/chapter. This is almost exactly what I was looking for. I haven't been faithful to my Bible reading and I realized why (well one of the reasons) - I do everything on my computer. So I downloaded this and it is great. The almost is because I would like to make my own notes - but for that I copy verses I want to comment about into Evernote. I also made an event in iCal that will open the app - so first thing each morning - I am created by the Word. No Excuses. I really like the app because it's a Bible app. Not only it's Bible app but also a KJV Bible which is the most trusted version where God preserved His words upon. He inspired the originals and preserved it through this version for 400 years. One thing that this app should have is where a user can open the BIble on a certain book, chapter and verse. If it be possible, add a commentary from th right resources. Other than that. This app is awesome! simple and works. i mean no pics but wow it's nice and has a usable plan. I dislike the fact that you are forced to begin at the beginning. Could this App have more options? I love the setup of the program! My only complaint is PLEASE add more translations! KJV is, of course, the most traditional one for English speakers, but usually not the best one for reading (for me, anyhow). I think many of us try to respect the KJV by reading it, but then, because we don't understand the older style of Modern English, we can get caught up wondering what the heck they are trying to say, rather than just being able to soak in the word for what it is worth. Wonderful simplicity to the app, and I love the structured reading plans! If I can get a NIV, NET, or ASV translation, this thing gets five stars! Regardless of faith, I've always believed that for cultural reasons it's important for everyone to read through the Bible at least once. Hypocrite that I am, I myself have never accomplished that feat, always bogging down in some of the denser books. I've often heard of daily Bible reading plans which would allow for finishing the Bible in a year, but I'm too lazy to actually pick up a real book and deal with the trouble of bookmarking, etc. Enter Daily Bible, the answer to my dilemma. 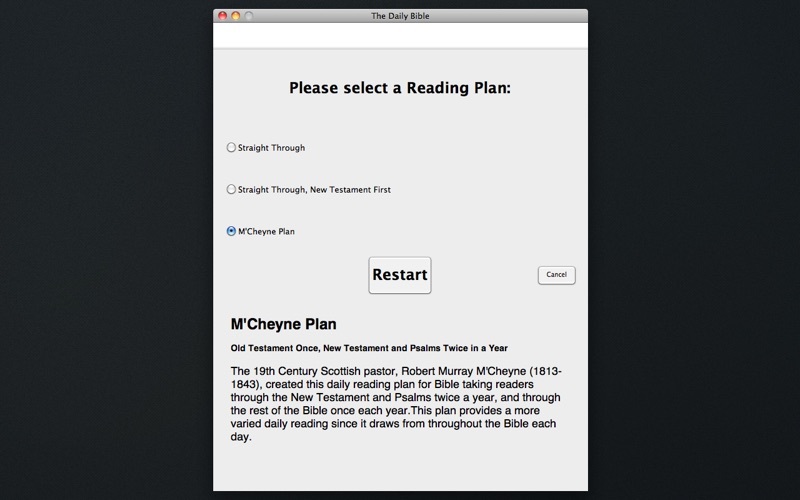 It's a simple app that takes all the guesswork and scheduling out of creating a yearly Bible reading plan. Just open the app each day, red to the bottom, rinse, repeat. Of course, you can skip back and forth if you want as well. I applaud the developer for going with the KJV version, rather than a more accessible but slightly more diluted translation. I'd love to see some more reading options to achieve at least some parity with other eReaders, and maybe text-to-speech options for us legally blind readers. Also, the app assumes your year starts from the day you opened the app, and there's no way to change your target finish date and simply catch up. Still, for a buck this is a pretty cool app. Wow talk about an amazing way to Stay connected with Our Father in heaven. To be able to get daily reading done in this format is amazing.